Feeling a little pinched after holiday spending? I know I am. So today seemed a perfect day to talk about Demeter. I am fond of Demeter, and was surprised to see I hadn't reviewed anything from the house since 2009, when I talked about Beetroot and Pruning Shears (thumbs up on both). I don't like everything Demeter makes — I don't even have time to try everything they make. Life is short, and Demeter is prolific. But every so often, it's fun to buy a bunch of their miniatures. Six dollars (6!!) gets you a 15 ml travel size, although you'll have to shell out a few dollars more if you want spray rather than splash. No, they're not high art (although some of them might just qualify as conceptual art), and no, they're not long lasting, and no, they don't always smell like what they're supposed to smell like. But sometimes they're spot on, and often, they're just plain fun. On the docket today: Dulce de Leche, Espresso, Chai Tea and Whiskey Tobacco. I was interested in Dulce de Leche primarily because I already love two milk-based fragrances from Demeter: Egg Nog and Condensed Milk (Egg Nog is wonderful, but Condensed Milk in particular is a great layering scent). I meant to compare them to Dulce de Leche but can't find either: raise your hand if your perfumes are a bit, shall we say, disorganized? I can never find anything. Going on memory, Dulce de Leche is far less milky-creamy, and far heavier on the cooked caramel aspect. There's also a very slight undertone of something like chocolate cake mix. It's ok, but I do not adore it, despite the fact that it seems to be longer lasting than the average for Demeter. I will stick with my Egg Nog and Condensed Milk, if I can ever find them again. Other than a latte every other week or so, I've pretty much given up coffee. I miss it enough that I've dipped into my son's Kopiko candies a few times, and I've been thinking of tracking down a box of Pocket Coffees. Espresso is a reasonable enough smell substitute, although it's just a teensy wee bit sweeter than you'd expect, especially in the top notes. It also makes a great layering agent — I liked Dulce de Leche much better with a dab of Espresso, and it played nicely with Brownie too. I drink Chai Tea nearly every single day, and the warm spicy smell is of course part of the charm. Demeter's version is nothing like what I drink, but after I got over the disappointment, I found that I liked it anyway. It reminds me of a dry, clove-heavy potpourri, with just the slightest undertone of dry black tea leaves. No milk to my nose, although it's listed, along with sugar, in the description. The lasting power is reasonable enough. Whiskey Tobacco is great fun. The opening is heavier on the whiskey than the tobacco — for a minute or two, you'll smell like you spilled your drink — but as it dries down, the tobacco comes to the fore. It's a sweet fruity pipe tobacco, unlit, with a slight undertone of vanilla. If you weren't expecting the sweetness, it might not suit, but I liked it, and it's easily adopted by either gender. Do name your favorite Demeter fragrance(s) in the comments! 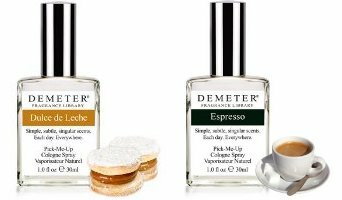 Demeter fragrances are available in 15, 30 or 120 ml Cologne ($6 – $39.50); some scents are also sold in matching bath, body & home fragrance products. Dulce de Leche…wow, I grew up in South America and one of my fondest memories is the taste of dulce de leche on just baked french bread with a little bit of butter. I’m happily married…but if I encountered a woman who was wearing dulce de leche perfume…oh wow. There are some places in LA where you can buy dulce de leche and it is well worth a drive. For those outside of So Cal, try mail order. You won’t regret it…I promise. Haagen Dazs Dulche de Leche ice cream is worth a try, too! Yes, that one is quite good! Ben and Jerry’s makes a Caramel Sutra ice cream that is also quite fabulous! Oh, good to know! Thanks! How did your Christmas mussels turn out? Oh, the mussels were a big hit! Thank you for asking! I decided to have most of the moisture come from sauteed onions and tomatoes and then just a dash of white wine–which simmered for a full 10 minutes to steam the mussels. Tossed in some fresh tarragon, parsley, garlic and lemon juice to perk it up–pretty tasty! I have both Caramel and Dulce de Leche, and find neither of them to be exactly what I was looking for, which is a sweet fresh milky caramel. (They both smell kind of synthetic, which obviously they are, though I wish they didn’t smell it.) But if you mix Caramel 50/50 with Black Pepper, you get the MOST AMAZING synergy — the pepper carves through the synthetic sweetness and you get something lush and spicy-zingy at the same time. Egg Nog might actually be the very best of the 200+ Demeters. Certainly in the top 10 alongside Ginger Ale and Graham Cracker. Egg Nog & Gingerale are near the top of my list too. I will have to try the Black Pepper! That combo does smell amazing. I must admit, when I think of eggnog I am biased. Friends and relatives lurching around with glasses and cartons of questionable lineage, caution thrown to the wind. A dash of black pepper might do the trick! Last month, I went to a Duane Reade that had just about the entire range of Demeter fragrances with testers for all but 1 or 2. I ended up with 30mls each of Tomato and Pumpkin Pie plus a free Salt Air roll-on (which will be on my freebie list as I don’t use roll ons). They’re cheap thrills and when I get tired of them, they’ll just go off into perfume limbo. While there I tried Egg Nog and Espresso, but they weren’t for me. I’ll have to try Whiskey Tobacco the next time I’m there. I think my nose got out of joint after smelling Hello Kitty – it was a vile cotton candy meets fruit chews combination. Is the tomato the fruit or the leaf? The label says Tomato but it smells like Tomato Leaf to me. It reminds me of the “Tomato Vine” hand soap from Target / Orla Kiely…subtle greenness. Smell like tomato leaf to me, too. A bit acrid, not fruity. Thank you both, I’ll have to try that one. Love tomato leaf. I’m sure it can’t top the CB I Hate Perfume Memory of Kindness, but worth a shot anyway. I haven’t sniffed Memory of Kindness, but the Demeter is definitely (imho) a pretty true tomato leaf. They have some of the Demeter line at Our Lady, but the ones I’ve tried didn’t really move me. It’s too bad the chai tea one isn’t hitting the mark, because that might be one of the few single “notes” that could potentially get me to consider a purchase! Love me a good tea scent. I wish there were testers some place near me! Would like to try some of their other teas — really wish somebody would make a great smoky black tea scent. I can’t do too much smoke–I have a bottle of Tea for Two, and the smoke is prominent enough in that one for me that I hardly ever wear it! I feel like I smell like I’ve been smoking cloves cigarettes more times than not–which is not a welcome scent to my nose. I *do* love a good milky, creamy, spicy tea, though! A perfect kind of comfort scent. That’s what I was expecting from the Chai, but that’s not what it is. Probably could layer it with something to get that effect though. I tend to be very cautious with layering–like I might inadvertently create a frankenfragrance that I can’t scare off with a push fork and burning torches! But I’m now wondering, maybe Jacomo #8 for the spices with, I dunno, Kenzo Amour for the creamy, milky aspect? Or would it be too subtle for layering effectively? The opposite usually happens to me…one or the other fragrance eats the other, so you get less layering than you expected. But yes, things can go wrong! I can’t remember the Jacomo well enough! But a spicier Amour sounds great. *pitch* fork, that should have read! Ah well, I imagine you got the idea! In any case, you may find the Jacomo worth a revisit–it’s a spicy tea scent. To my nose, it’s Tea for Two without the smoke and with a touch of clean musk to the dry down. It’s softer than TFT and doesn’t last as long on me, but it has that cozy tea and full of spicy cinnamon and cloves. It’s nearly what I’d want–but could do with some milk in that tea! That was probably the one I liked. I think I sent them all to Kevin because he was interested in them. I’ve never tried them, but DSH, Ava Luxe, and Demeter all make milk scents — they sound like relatively inexpensive options for layering with Jacomo 08. Jo Malone and Philosophy had limited edition milk fragrances too, I think. Jacomo 08 is described as having a “milky accord.” I do smell it. Perhaps you are anosmic to it? As for the #8, hard to say if I’m anosmic or if it just isn’t all that milky!? I remember when Ulta had them, and apparently many Walgreens do now, as well. Unfortunately, not near me, either. But the good news is that they accept returns, no questions asked. Have to add that I love carnation scents, but most of them lack the clove-nutmeggy sweetness that I cherished when I grew English pinks many years ago. A light overspray of Demeter Eggnog adds the missing note. Oh, that’s so interesting, would never have thought of that. But many carnation scents also no longer smell clove-y because of IFRA restrictions, so wonder if newer bottles of Egg Nog are likewise blander? I bought a few purse sprays from Demeter before Christmas, unsniffed. I’ve had some requests from my hospice clients for particular nostalgic scents they’d like to revisit, and I plunged into CB I Hate Perfume but gosh, they’re so pricey. Thus, Demeter. I don’t like any of their florals I’ve sampled except for Flower Show. That’s all it smells like. A flower show, but spot on. Not flowers in a vase in a florist’s, not a funeral home, not a garden. As opposed to Turin and Sanchez, yep, sometimes I like to smell like flowers. I’m keeping that one, and Angel Food. It’s warm and comforting. White cake batter with a hint of coconut which is NOT in Angel Food cake, but what can I say. Smells the same to me. Both of these are old favorites. I also received a free Salt Air body oil, and I absolutely adore it. A quiet evening on the beach, sans music, lotion, barbecues and beer. A quiet sunset, with hints of the ocean, seagulls overhead and surfers on their boards. Calming, reflective. Since I can return what I don’t want, I have a whole new wish list compiled, and thanks, Robin, for your post. I do have a question, if anyone would like to comment. I bought the sprays, but as Demeter is notorious for no sillage, I’ve learned to spritz on hair and clothes. I’m thinking that the perfume rollerball might be better, or perhaps even using the room diffuser oil as a personal fragrance. Any advice? Oh, I’ll have to try Flower Show. It sounds sort of like their Greenhouse, which I do like. Have never tried the rollerballs or diffusers, so can’t help, sorry! Thanks! I’m wondering also how people store their samples, and you’ve outed yourself. I would imagine you have a lot, and I definitely don’t. I plunge mine upright into a pretty bowl filled with sand. Would anyone else like to share advice? But seriously, if you search this site by “storage,” you’ll find a three-part series and parts 1 and 2 cover samples. The Demeters are fun to play with, aren’t they? I like Eggnog, and love Earl Grey Tea – although it lasts literally seconds. I also like one of their incense scents (Holy Smoke? Holy Water? – I’d look to see which it is, but I appear to use the same organization system you do, Robin. The “it’s in here somewhere” system. The fun part is layering them. Paperback, Russian Leather, and Pipe Tobacco makes a good combo. When my niece was little, she used to layer Graham Cracker, Marshmallow and Dark Chocolate. Holy Smoke is pretty darned good. Can’t remember if I tried Holy Water. Paperback, Russian Leather + Pipe Tobacco sounds fun! I believe you have previously mentioned Holy Smoke. Riding Crop is also on my list as per someone on Demeter’s site who mentioned them both in the same breath. I will be very pc here and say that it sounds rather provocative, but interesting. Possibly not, but you might surprise yourself! Their Honeysuckle makes me happy. I think B&BW’s Wild Honeysuckle rocks. Too bad it is discontinued (or at least I have not seen it in stores nor is it on the website)…there is something called Rome Honeysuckle Amore which I have not smelled. I don’t have high hopes though since companies that mess around with fragrance usually messes it up royally the wrong way. Oh, good to know, I should try that one. I haven’t tried anything from Demeter, but now I’m curious if layering Espresso with Condensed Milk would smell like Vietnamese iced coffee. Yum. I would think that would work.